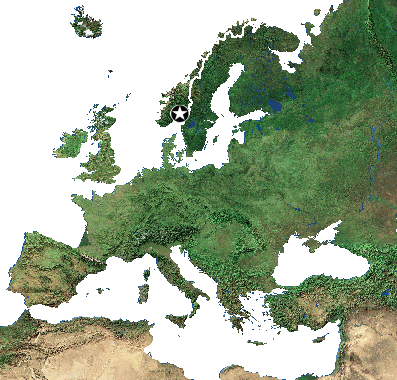 Norwegians originated directly from Viking tribes, who were famous for plundering all other northern European nations. In 872 Harald I Fairhair unified most of the tribes and announced himself King of Norway. His brutal rule encouraged his opponents to look for a better life on islands of Northern Atlantic, thus colonising many of them. Norway possessed the largest territory in 13th century, but already several decades later greatly reduced by the bubonic plague Norwegians looked for protection in Kalmar Union with Sweden and Denmark. It was the strongest military alliance at the time, but Norway fell under Danish rule for almost 500 years. Only in 1905 Norwegians proclaimed independence. After discovery of large oil and gas deposits in the '60s of 20th century Norway became one of the richest countries in the world and the nation voted for staying out of European Union.